Painter's tape is a gift sent to us from the heavens. With painters' tape, you can visualize a room's entire layout, adjusting it as you see fit---without committing to anything. Perfect for you scaredy cats and design commitment-phobes out there! You should own a roll at all times. 4) Wall art (tape it out and adjust to make it centered...then measure the width. Use a marker or pencil to mark a dot in the center, and you'll know exactly where to hammer the nail. By marking the tape instead of the wall, you avoid unecessary damage if you change your mind). 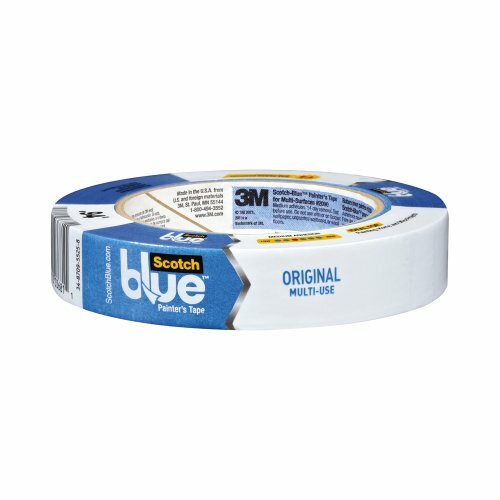 Painter's tape can also be used to figure out furniture locations. Let's say you want a bigger coffee table, but aren't sure if it'll impede the flow of the room. Tape it out and you'll see if you can walk around it comfortably. The fact that it isn't too adhesive enables you to use it without damaging your walls. Taping out sections of space makes it easy to envision the room you are trying to create. Take a headboard, for instance. You know you need one, but aren't sure about the height. Walk into the room, and visualize the ideal height you're going for. I make a mental note of the spot, and quickly put tape there. (This process is much easier with other people helping you). This is a "before" photo of a master bedroom I am working on. I needed to visualize a proper headboard and window treatments. This is the next step of a work in progress. With tape up on the walls, we get an idea of how everything will pull together. Things have moved since this photo was taken, but the general idea is there. No need to hammer any holes! It's important to place art under proper lighting. The painter's tape really helps give an idea. Stay tuned for upcoming photos of that master bedroom! It will NOT disappoint!